Democrats Are Rushing a Jobs Guarantee. It’s a Huge Mistake. Democrats Are Rushing Into a Job Guarantee. It Could Be a Huge Mistake. Two years ago, the notion that the federal government would hire anybody who didn’t have a job was so obscure that it did not even qualify for Bernie Sanders’s blue-sky social-democratic wish list of a platform. Since then, the jobs guarantee plan has materialized almost out of nowhere and ascended nearly to the status of Democratic Party doctrine. Last spring, the Center for American Progress, a progressive think tank with a close relationship to the Democratic Party, proposed a version of a federal jobs guarantee. Another liberal think tank, the Center on Budget and Policy Priorities, commissioned a report by outside scholars Darrick Hamilton, William Darity, and Mark Paul that proposed a more fleshed-out version. It has cornered the progressive small-magazine market, with fulsome endorsements in The Nation, The New Republic, the Intercept, and Democracy Journal. In recent weeks, some version of a job guarantee has gained endorsements from senators and potential presidential candidates Cory Booker, Kirsten Gillibrand, and Bernie Sanders (in exactly that somewhat surprising chronological order). The customary years, or decades, it takes for a policy concept to matriculate from academic white papers to party platform has been compressed into mere months. The party’s rapid embrace of a job guarantee is understandable, since the idea has enormous power as both an abstract social ideal and as a political messaging vehicle. The weak point of the Democrats’ economic appeal has always been the (heavily racialized) accusation that they are subsidizing sloth. Even working-class people who stand to benefit directly from government activism often recoil at the notion that their own hard work might subsidize lazy neighbors. A job guarantee neutralizes that objection, co-opting the conservative themes of self-sufficiency and hard work. The early lines of attack conservatives have devised against the job guarantee proposal are almost a testament to its popularity. If the government offers decent compensations, warns Brian Riedl of the conservative Manhattan Institute, “There will be pressure to introduce a higher wage or certain benefits that the private sector doesn’t offer.” I suspect Democrats would have little fear about facing attack ads warning that under their plan, employers are going to have to give everybody a raise or more generous benefits. The goal of true universal employment would also fulfill some of the deepest social aspirations of right and left alike. Unemployment imposes massive social costs. People who can’t find jobs suffer mental and physical health consequences. Young people who are unlucky enough to enter the workforce (or to try to enter it) during a recession have lower lifetime wages than those who graduate from school into a healthy economy. Some of the sharpest social criticism from the right describes the cultural effects to communities where the norm of working-age adults having regular employment breaks down (think J.D. Vance’s Hillbilly Elegy.) In depressed rural and urban areas, chronic unemployment seems to defy traditional remedies. Unfortunately, Democrats do not yet have a proposal that can bring these aspirations to life. One problem to work through is the traditional Democratic question of how to finance their new program. (Republican policy ideas never have this issue —they just put everything on the credit card and stick the next president with the bill.) It’s quite a large expenditure, perhaps half a trillion dollars a year, depending on the exact contours. Progressives have circulated polling showing support for a job guarantee financed by a 5 percent income tax hike on earnings over $200,000 a year, but Josh Bivens at the liberal Economic Policy Institute notes that that would cover less than a fifth of the cost. And even that figure optimistically assumes the federal job guarantee would attract only people who are currently unemployed or underemployed. Since the most popular job guarantee plans would offer relatively solid wages and benefits ($15 an hour plus benefits), they would probably draw applicants who currently have jobs with stingier compensation. If that happened, as you’d expect, the cost of the program might balloon up to several times over. Once you start financing the program with taxes on the middle class — which would probably be necessary given the scale of its cost — then the popularity would drop off precipitously. That’s just the small problem. The big problem is that designing a federal jobs program large enough to usefully employ all applicants is a devilishly complex challenge that none of the proposals currently circulating have worked through. Proposals to implement universal access to day care, or single-payer health insurance, have plenty of models up and running in industrialized democracies. The job guarantee doesn’t have an easy showcase to copy. Advocates point to the Works Progress Administration during the New Deal, which put millions of unemployed men to work. They have also mentioned the Jefes program in Argentina from 2001, and a rural jobs program in India. What all three cases have in common is that they functioned in an environment where the work required relatively little training or equipment. 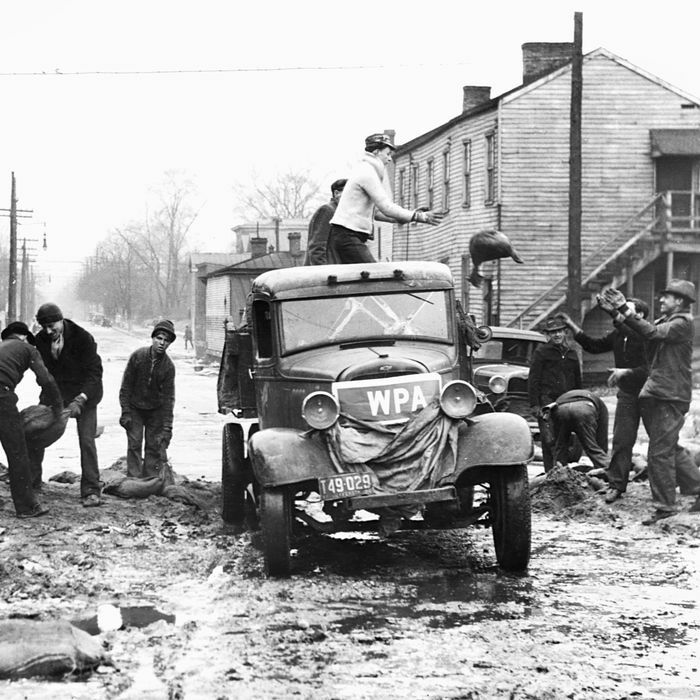 The WPA is justifiably famous, but these days, not a lot of construction work can be done with just shovels. The Center for American Progress cites large, unmet needs that could be filled with unemployed workers: “There are not nearly enough home care workers to aid the aged and disabled. Many working families with children under the age of 5 need access to affordable child care. Schools need teachers’ aides, and cities need EMTs.” It’s true that some temporary needs could be handled with the temporary workers who would be hired by the government for this purpose. But the program by design would fluctuate in size along with the business cycle, swelling during a recession, and contracting during a recovery. You can’t just have your teachers and child-care workers come and go. The jobs in the job guarantee would have to be for work that is either temporary, or optional. That constricts the kinds of work that can be done. This is a more imposing obstacle than you might think. (I was far more optimistic about the potential for a federal job guarantee before I began studying the details.) In both the private and public sector, jobs are designed with an output in mind, with employing people a by-product. If employing people becomes the primary goal, then instead of starting with a job description and finding people who can do it, you start with the people you need to hire and then find work they’re qualified to do. And this task would be undertaken, even with a several year ramp-up, on a massive scale. The white papers I’ve read have all basically yadda-yadda-yaddad away this enormous managerial challenge. If the government decided to reduce both the cost to taxpayers, and the ambition of the program, it could scale the job guarantee back to a low-wage make-work program — finding tasks people can do during working hours as a bridge to prepare them for a real job. That would be more feasible to design, but also fall far short of the lofty promises currently dancing in Democratic heads. Job training and workfare programs have a pretty discouraging history. Booker has, appropriately, scaled back his job guarantee ambitions to match the embryonic state of its policy development. Booker’s version is a three-year pilot program that would pick up to 15 communities and give them funding to employ every adult at $15 per hour plus health care and family and sick leave. A demonstration program seems like a sensible step to test out the job guarantee concept and work out the kinks. But the rhetoric many progressives are using to sell this idea promises something much bigger and faster than a pilot program. One might notice in this story a chronological gap of several decades between the virtuous Roosevelt and the craven modern neoliberals. At no point in this history — not during Roosevelt’s presidency, nor that of Truman, Kennedy, or Johnson — did Democrats actually design, let alone pass, a full-scale plan for permanent guaranteed employment. That fact should tell us that figuring out how to give every American a job is actually a really hard problem, and there may be a reason — other than a lack of concern for the well-being of the working class — that it hasn’t happened. In the meantime, there are plenty of better-developed policies that can help lift incomes for poor people. And some of them will be fighting for the same finite pool of resources that might go to a job guarantee plan. There are proposals to raise taxes on the rich to pay for expanded health insurance, or universal pre-K, or a large-scale public infrastructure plan, but taxing the rich can’t pay for all those things. Slotting a half-baked concept at the front of the queue seems, at best, wildly premature. Democrats Are Rushing a Job Guarantee. It’s a Huge Mistake.